The proportional pressure reducing valve PDR08-02 is a direct-acting 3-way spool type valve, with relief included. 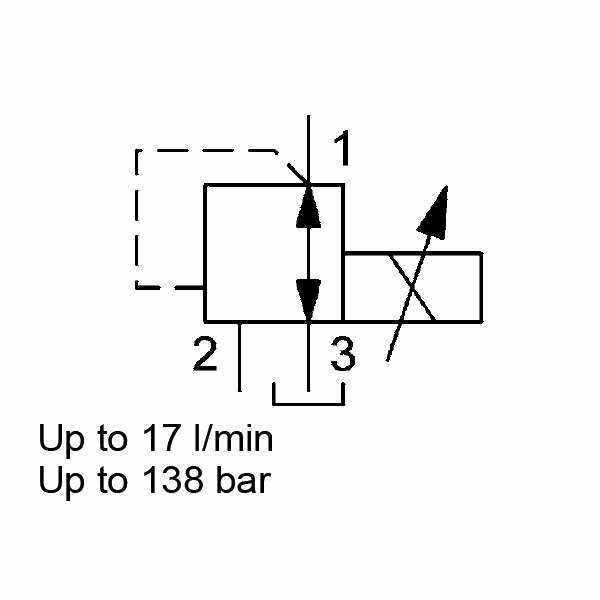 In the normal position (no current signal), it closes the valve on the inlet side (port 2). Therefore, it connects the outlet side (port 1) to tank (port 3). If the solenoid has energy, it applies pressure to the control piston in proportion to the electrical current. The control piston therefore moves and allows flow from port 2 to port 1. Any pressure at tank port 3 is additive to the pre-set control pressure. If, as a result of external factors, the pressure at port 1 rises above the set pressure, the valve opens from port 1 to tank port 3. To function correctly, the inlet pressure must be greater than the control pressure. There are differences between PDR08-02 and PDR08-01. In contrast to the PDR08-01, the design of the PDR08-02 is asymmetrical. I.e. the valve is rated from P to A (pressure reducing function) up to 17 l/min and from A to T (pressure relief function) up to 10 l/min. Moreover, the valve has zero overlap which has the effect of reducing the hysteresis and leakage.